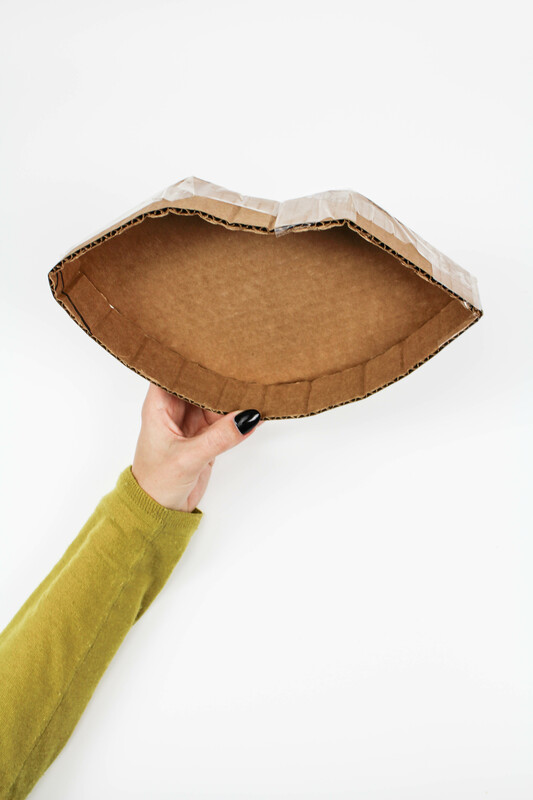 First, draw out the shape for your lips onto your cardboard. (You can make them as big or as small as you want). 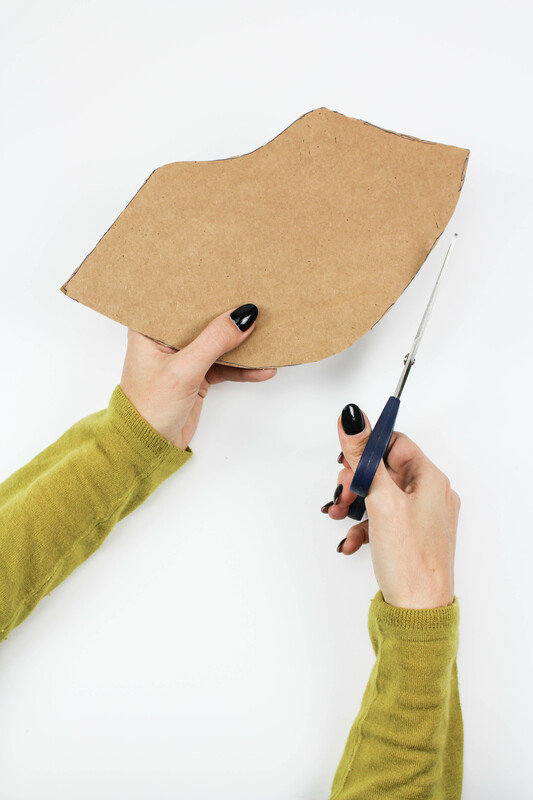 Once you have settled on your design, cut them out with your scissors. 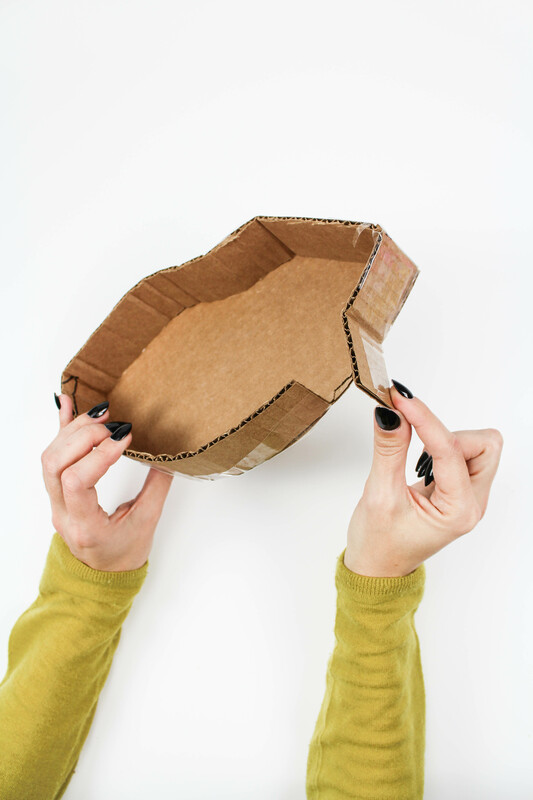 Trace the shape onto the cardboard again and cut out a second set of lips. 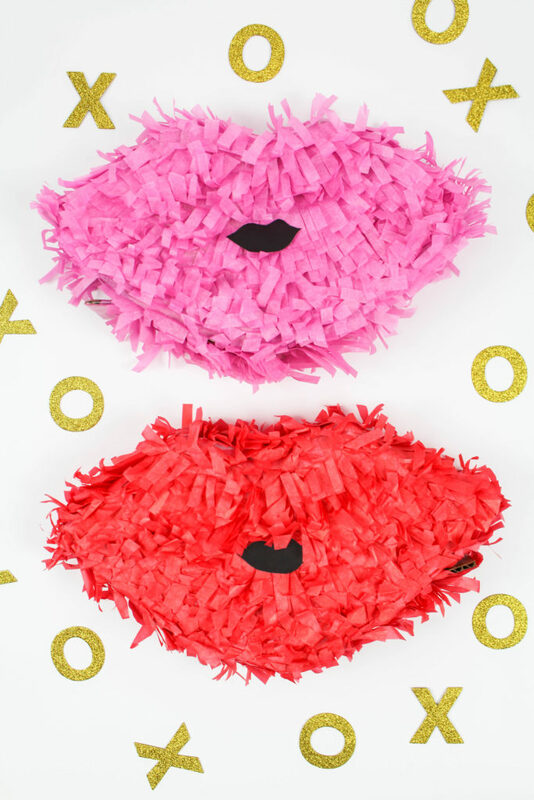 (You will need a total of two lip shapes for each piñata). 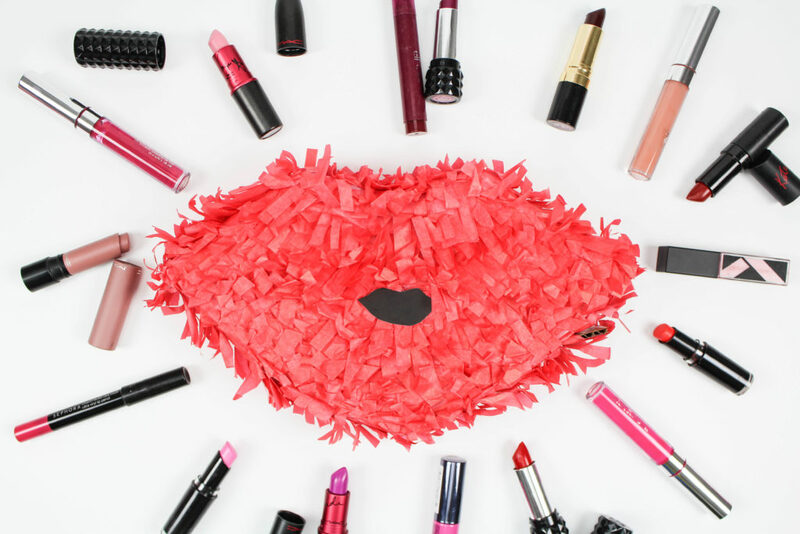 Once your shapes are cut out, using either a fabric measuring tape or a piece of ribbon or string, measure around the outside of your lip shape. 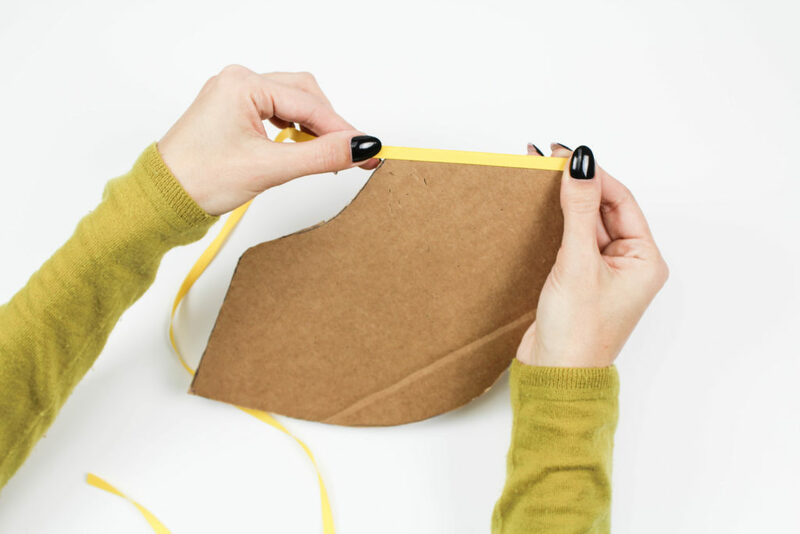 Using the ribbon or measurement as a guide, cut out a long cardboard strip, in whatever width you want. 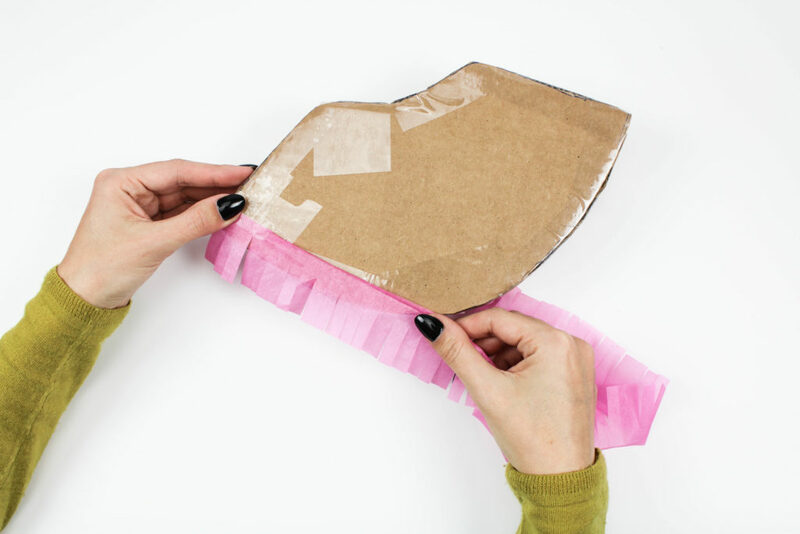 This cardboard strip with create the “middle” or center section of the piñata. Begin wrapping your cardboard strip around the outside of your lip shape to bend it into the right places. Once the strip is “worked”, use packaging tape to begin securing it to the outside of the lip shape, all the way around, until you have a solid border. 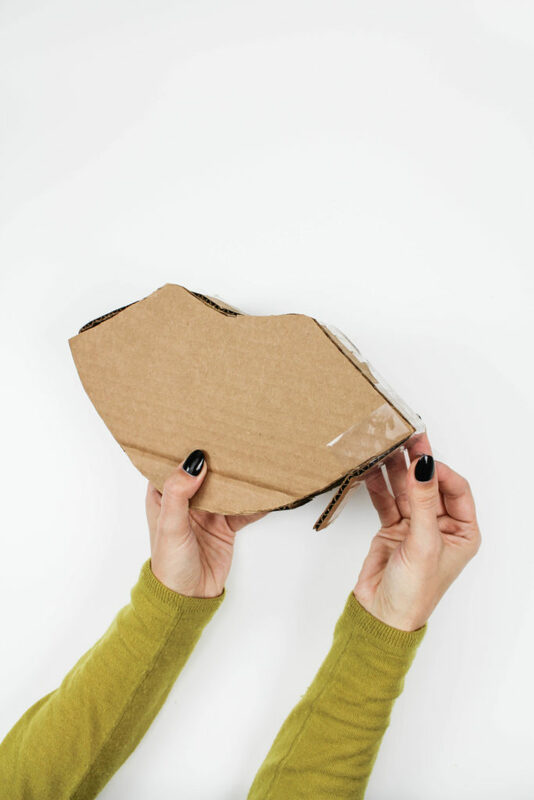 Place the second lip shape on top of your lip “frame” and repeat the process of using the packaging tape to secure it all the way around, ensuring you are matching it up to the bottom piece exactly. 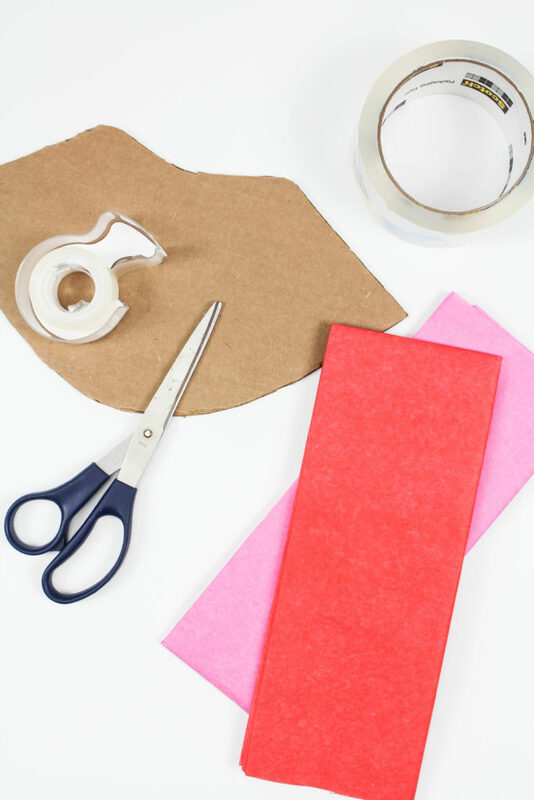 Next, begin cutting your tissue paper into strips, about 1-1.5″ wide. 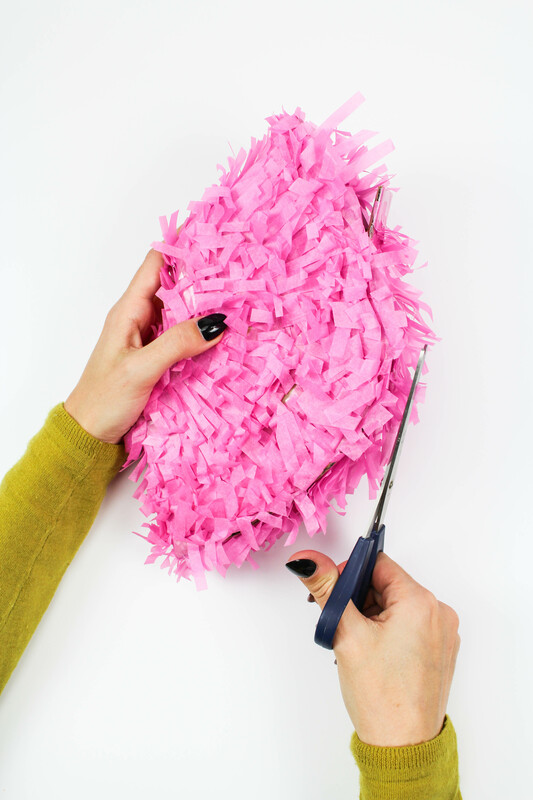 “Fringe” your tissue paper strips, leaving a space at the top where you’ll be able to tape or glue it onto your piñata. Using Scotch tape or glue, begin applying your tissue paper strips, in layers onto the piñata shell. 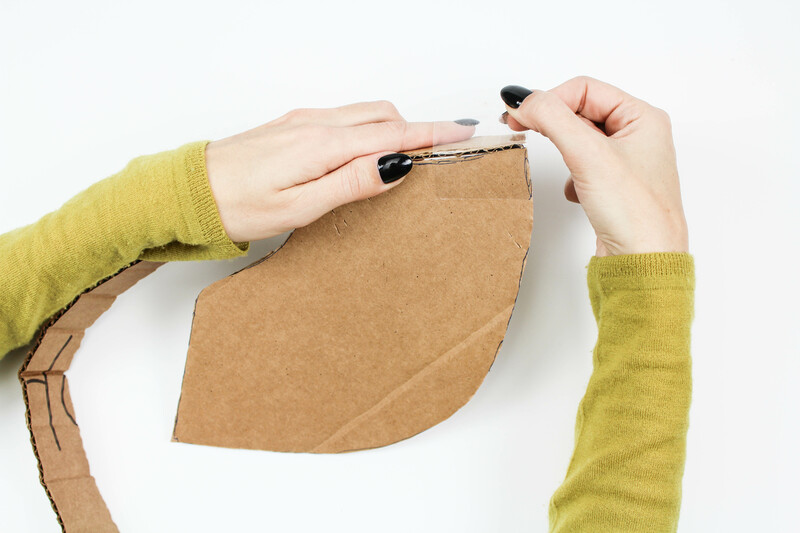 Start from the bottom and work your way towards the top to ensure even and full coverage with the least amount of tape/glue showing. Because of the lip shape, it is a little tricky to apply them. I wrapped full pieces from side to side and around the edges, and then finished the top and bottom sections last. 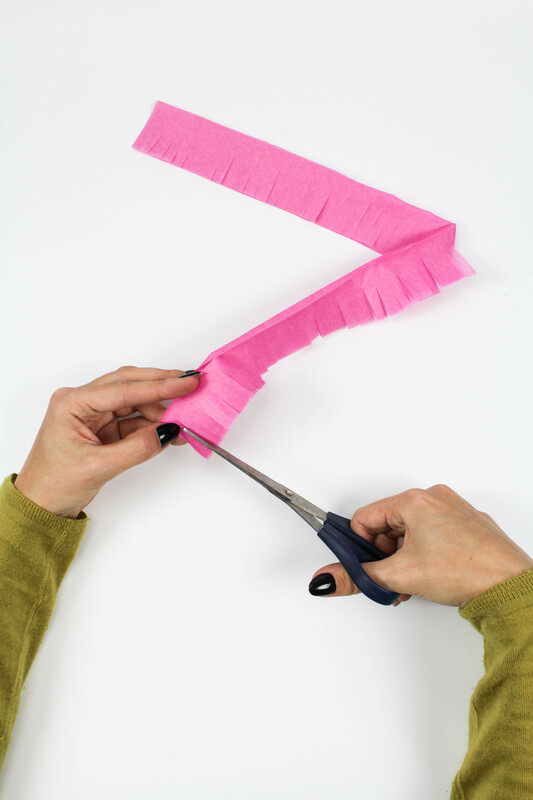 Once completely covered, use scissors to trim off any sections that are too long or a little unruly. 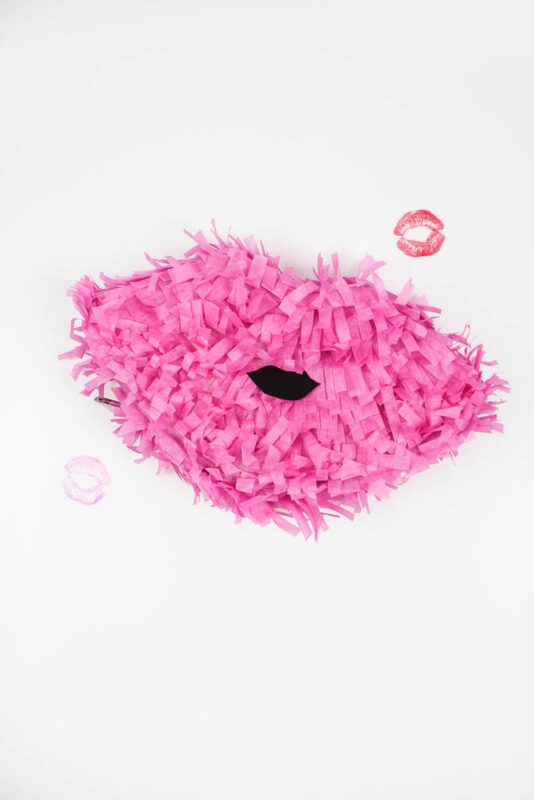 Using black paper, cut out another smaller lip shape (the same shape used for your piñata shell). 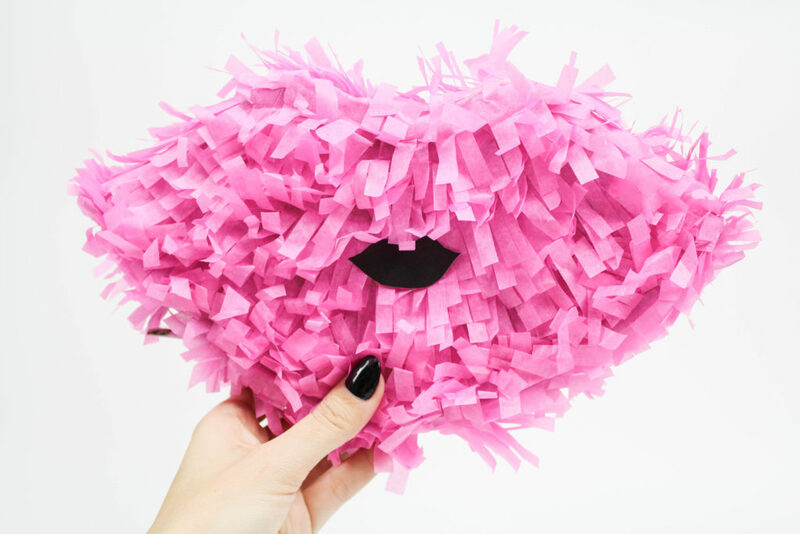 Glue or tape it into place onto the front and center of your piñata. 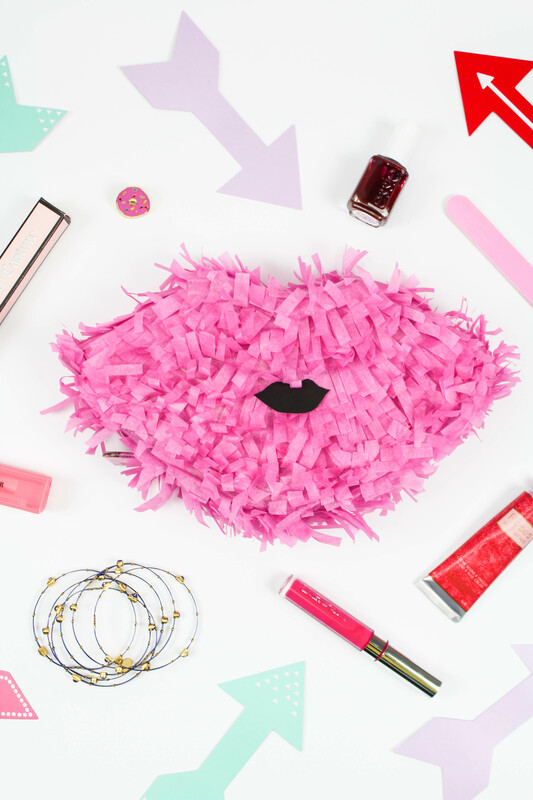 Fill them with all of your bestie’s favorites like nail polish, lip gloss, gum, perfume, jewelry, gift cards, or anything else that you can fit in there! 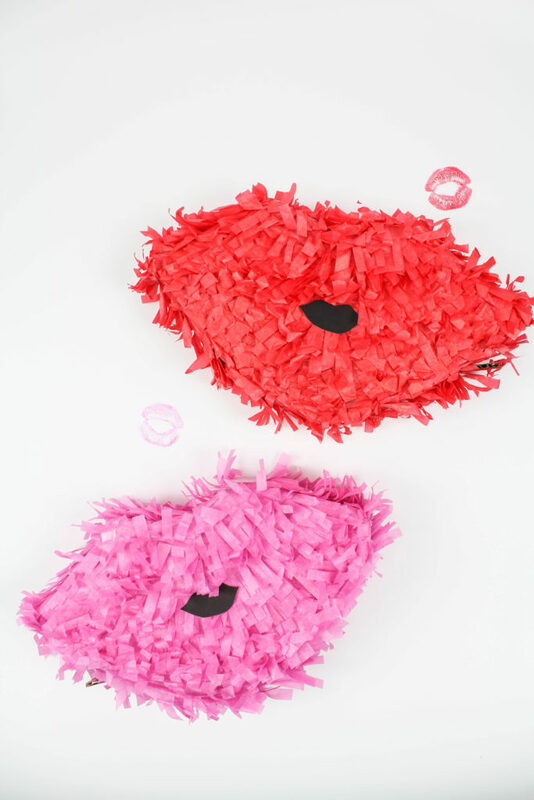 These Valentine Lip Pinatas make such fun little packages to un-wrap and are even fun to keep too! They would also be super cute placed on a table for individual place settings for a Gal-entine’s Day brunch or a bachelorette party!